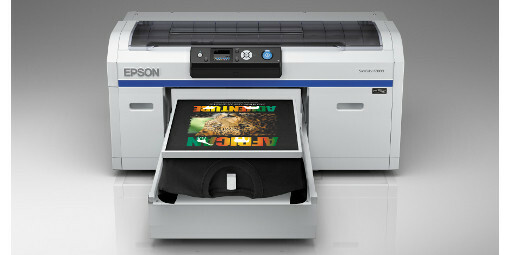 Epson has launched its first direct-to-garment T-shirt printer, the SureColor SC-F2000. With the garment printing market expected to be worth over €200 million by 2014, small to medium businesses can benefit from the SureColor SC-F2000’s revenue-generating features. Combined with high performance, low maintenance and running costs, it enables businesses to offer a new t-shirt design and print service. Online t-shirt shops, production t-shirt printers and even corporate users will benefit from the SC-F2000, as its ink is crack resistant and is soft against skin. Users can configure the system to suit their needs by choosing from two sets of CMYK ink for white garments or CMYK with up to four white inks for coloured garments. Garment Creator software by Epson is bundled with the package, which includes a cost calculation function, allowing you to estimate the print cost by calculating the amount and cost of the ink used for each print job. This can be beneficial if you want to set a tax rate or discount. This design software enables designers to unleash their creativity and easily produce customised, eye-catching designs on t-shirts, caps and bags up to 25mm thick. Featuring Epson’s durable TFP printhead, the SC-F2000 is capable of printing a single white t-shirt in 27 seconds when using dual colour mode and a dark coloured t-shirt in 111 seconds, using white and colour ink, so production is quick without sacrificing print quality. When used in conjunction with Epson’s UltraChrome DG Ink (available in 250 or 600ml cartridges), the SureColor SC-F2000 excels on dark fabric, because its white ink is tough. The white ink is circulated within the system and has been designed to reduce clogging, which increases productivity, allowing deadlines to be met consistently. The SC-F2000 offers a resolution of up to 1440x1440dpi for accurate dot shape and placement, while its wide colour gamut produces vibrant colours, sharp contours and smooth gradations. Despite its ability to create a lasting visual impact, Epson's UltraChrome DG ink is kind to those it comes into contact with. The eco-friendly ink has been awarded a part certification from Oeko-Tex® Standard 1001, which means it doesn’t contain any harmful substrates.